Surf7.net Review 2019: Is Surf7.net a Good Hosting? Surf7.net has been providing Malaysian based hosting since 2002. The plans are feature-packed and affordable but geared primarily towards experts. Surf7.net, founded in 2002, has more than 16 years of experience in the website hosting industry. It’s a Malaysian company with an English website, and currently in excess of 1,000 customers. Surf7.net has its servers co-located at TM Net Data Center located in Cyberjaya, Malaysia. The server hardware is solid with Intel Xeon processors, SAS hard disk (unfortunately not the far faster SSD), and branded Dell or similar servers. Plus, the uptime guarantees are solid for the server and network, at 99.5% and 99.9% respectively. Aside from automatic daily backups and cPanel access, which are both helpful for beginners, the features appear to be primarily geared towards experts. There isn’t a website building tool, however, there is a one-click installer. On the other hand, the features for experts and developers are comprehensive. 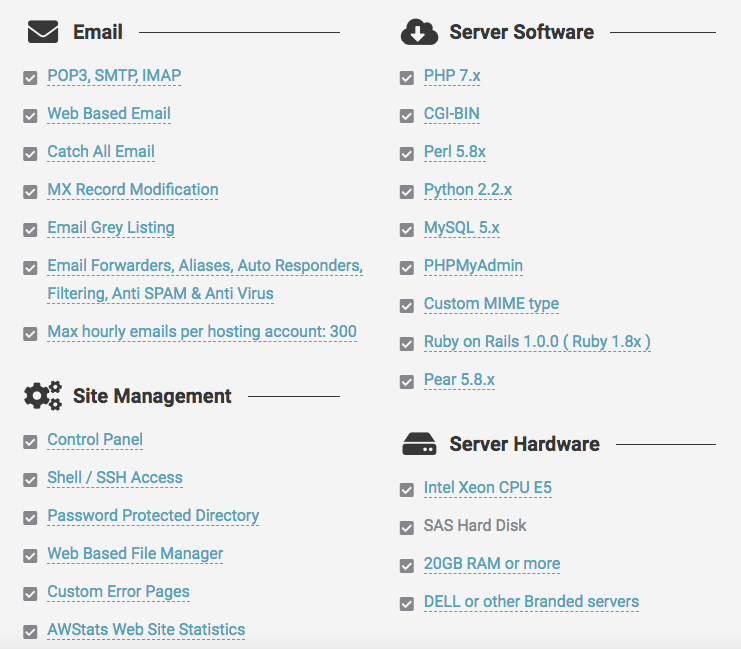 There are all of the standard features (MySQL, FTP, phpMyAdmin, and PHP up to version 7), as well as some added extras. For instance, there’s support for Python and Ruby on Rails, as well as Cron jobs and SSH access to ensure your website runs smoothly. While there’s only one base plan, you can customize it as required upon checkout. For example, you can purchase add-on domains, extra disk space, bandwidth, and so on. Of course, this all costs extra, but it allows you to pick and mix the resources you require. The base plan is well-priced and in line with similar shared hosting suppliers. While you’ll get a free SSL certificate, you do need to take into account the cost of any add-ons and a domain name. Plans can only be bought in one, two, or three-year terms, which could be quite off putting for new customers. If this feels a bit risky, you can get started with a 30-day money-back guarantee. If you’re a customer, customer support is available via live chat, tickets, and emergency pager 24/7. However, sales inquiries are only by phone, email, and WhatsApp from 9:00 a.m. to 5:00 p.m. I sent the team an email at around 1:00 p.m. U.K. time on a weekday and was happy to get a reply on the same day, answering my question politely and in full. If you prefer to research your own solution, existing customers can access flash tutorials, a knowledge base, and manuals. Surf7.net has developed more than 500 websites for its clients, so it’s reassuring to know that your data will be handled by a team of tech experts. 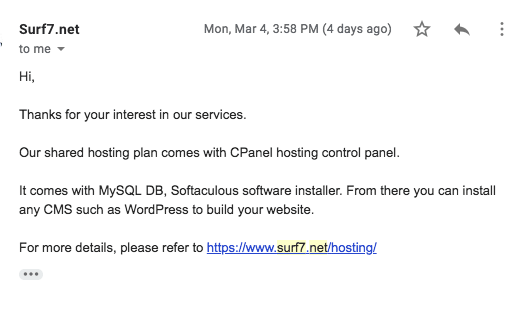 Overall, I was pleased with the offerings by Surf7.net. The plans are feature-packed and well-priced if overly geared towards experts. Wondering how Surf7.net stacks up against other Web Hosting companies? Enter any other Web Hosting company and we will give you a side-by-side comparison.